Click this button to open the Engagement Properties in CaseWare to make quick changes to the properties. 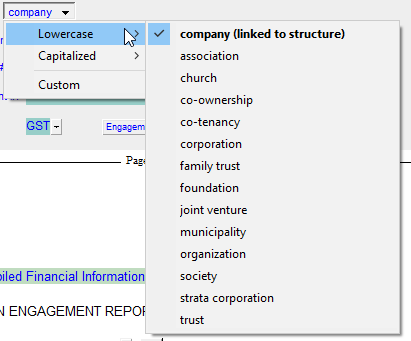 Use the Structure popup menu to select Limited Company, Partnership, Proprietorship, Not for Profit, PSAB (9 column statement format). Depending on which option is selected, there may be changes to the default title of owner(s) description and statement names. 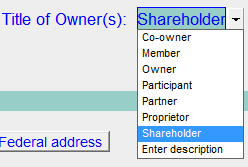 The number of owner(s) option sets any reference to owner(s) as either single or plural (for example Due to shareholder or Due to shareholders). Choose the option or type in the entity description as required. The default option is the first bold option in the popup menu and is based on the type of structure chosen. Use the Optional alternate name to add a second line below the company name at the top of each statement and on the engagement report. This is used if the trade name differs from the legal name (Operating as menu item), or if the company's name has changed since the last financial statement (Formerly menu item). Enter the other company name in Optional alternate name field. You may also enter text into the blue area and leave the popup menu to the left blank. This is useful if you wish to provide a description of the company below the main title and on the Engagement Report (for example Joint Venture). If you leave the blue area blank Jazzit automatically skips this option. This information is used to complete the CRA enclosure letter and client enclosure letter. Click on the Display Federal Address button to show the address details. Click on the Update to default button to bring in the default address from the RD - Firm Profile. This information is used to complete the Provincial tax enclosure letter and the client enclosure letter. Your default tax addresses can be changed by clicking on the respective buttons and overriding the address field. Click on the Display Provincial Address button to show the address details. Click on the Update to default button to bring in the default address from the RD - Firm Profile. The default sales tax type is based on the province entered in the engagement properties. Use the popup menu to select an alternative tax type if different from the default. The title of owner(s) can be used to change the words used to refer to the owners. You can type any description in the blue cell if you need something other than the options in the menu.